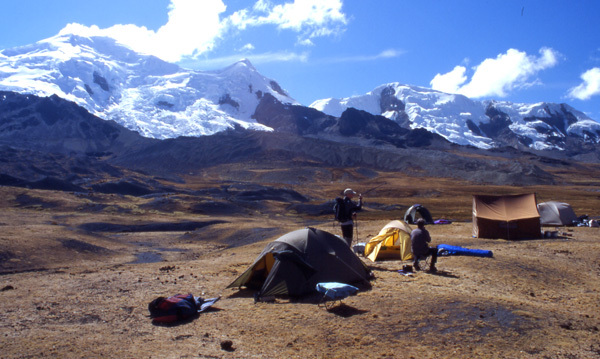 Trekking in southern Peru with easy climbing options. This is a two part trekking holiday. Firstly we'll walk the Inca Trail to Machu Picchu, then we will do a remote trek in the Vilcanota mountains, with the option to climb one or two peaks on our way around the peak of Ausangate. We start the trip with several days sightseeing in and around Cuzco, the ancient capital of the Inca Empire. This will give us a chance to see many of the ruins in the area. 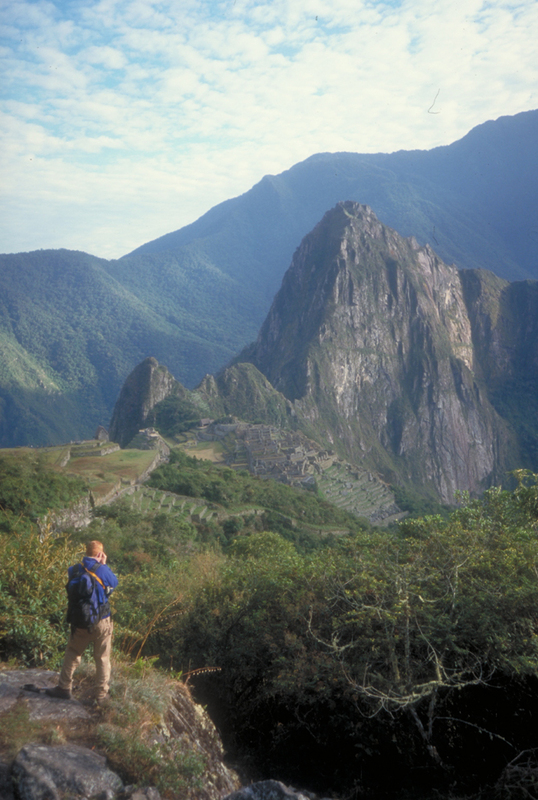 We will then walk the Inca Trail to the lost city of the Incas at Machu Picchu. This is a fascinating walk through the high jungle on ancient Inca pathways that will take us four days and finish with a day at the spectacular and world famous ruins of Machu Picchu. Finally, the hhighlight of this trekking holiday will be the circuit trek of Ausangate in the Cordillera Vilcanota of southern Peru. 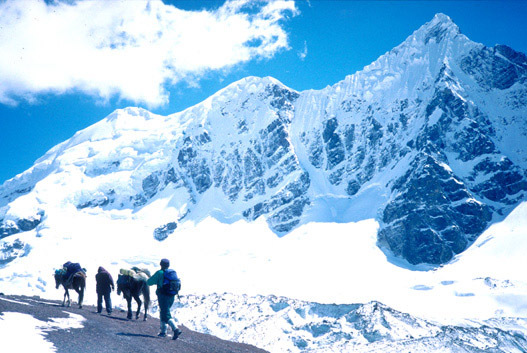 This is a relatively hard and wild trek, crossing two passes of nearly 5100m. Plenty of llamas are guaranteed. The trek will take us a total of eight days, allowing time to explore some of the side valleys. On our way round the circuit we have two climbing options, when those who are interested will have the chance to climb two peaks including Huayruro Punco 5500m and Campa 5470m. Although some previous experience of hillwalking, trekking and camping in remote areas are an advantage, both the trek and the climbing options are suitable for anyone who is fit and adventurous. Ausangate from just above the Upis campsite. Because the city lies at an altitude of 3500m we'll spend a couple of days in Cuzco when we first arrive in Peru, getting used to the altitude. This will give us time to explore many of the ruins including the magnificent toothed fortress of Sacsayhuaman which sits on a hillside above the city and is a rival even to Machu Picchu. There will also be time to look around the markets of Cuzco and nearby towns. The most spectacular way to arrive at Machu Picchu is undoubtedly the way the Incas designed the city to be approached. The Inca Trail to Machu Picchu is a four day walk along beautifully engineered Inca 'roads' crossing several high passes up to 4200m above sea level. The Inca 'roads' include long flights of steps, traverses above deep ravines and tunnels cut through solid rock. On the way to Machu Picchu the scenery becomes increasingly spectacular with views to Salcantay and other snow capped peaks. 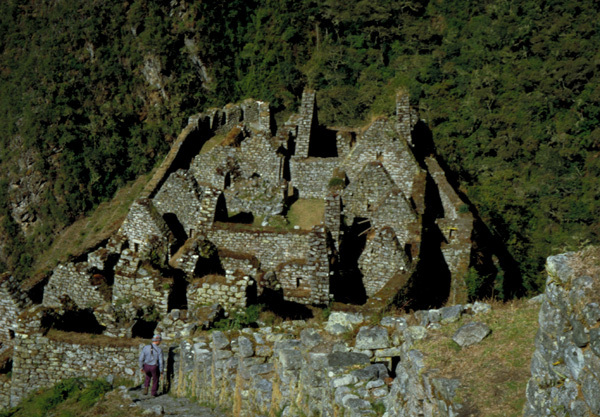 We will also pass many impressive ruins from the time of the Incas, some still half hidden in the thick forest. Then on the very last day we'll get our first view of Machu Picchu from the pass known as Intipuncu - the Gateway of the Sun. Machu Picchu (pictured above) was rediscovered by Hiram Bingham early this century when he was looking for a fabled 'lost' Inca city in the deep valleys around Cuzco. This is the most famous ruin in South America and not without reason. The setting is superb and the ruins themselves are extensive with many houses, temples and fortifications. The exact reason the Incas built Machu Picchu is not known (because they left no written records) but it was clearly a site of ceremonial importance. We will have a whole day at the ruins. The Cordillera Vilcanota are a compact mountain range situated about 100km south east of Cuzco. 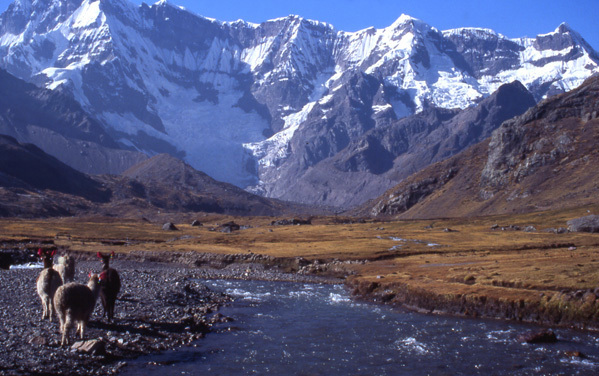 They are perhaps the most rugged and remote mountains in Peru. The range contains several peaks over 6000m high, including Ausangate the highest peak at 6384m. The lower valleys that we trek through have been glaciated in the past and many small lochs remain behind. There are some idyllic campsites, several beside natural hot springs. Most of the valleys in the Vilcanota are still used as pastures by the Quechua speaking Indians and we are sure to see llamas and alpacas grazing. We start and finish the trek in the small village of Tinqui on the northern edge of the Vilcanota mountains. The trek will be fully supported, with horses or mules carrying all equipment, but is still a relatively strenuous undertaking because of the high passes (up to 5100m) that we will cross. Typically we'll walk for six hours per day. The basic trek normally takes five days but we've allowed extra days in our schedule so that those taking the climbing option have time to climb. On summit days those not climbing will have the option of a rest day or a day spent exploring the high mountain valleys. For those wanting to take the climbing option there will be a chance to climb a couple of peaks on our way round the Vilcanota. These are usually Campa 5470m and Huayruro Punco 5500m but the final choice will depend on current local conditions. Both peaks are relatively easy one day ascents over glaciers with some rock scrambling. There is no extra charge for this option. There are a number of interesting birds, animals and plants that we may see on our trek. Many of the valleys we walk through are still inhabited by llama herders and the domesticated llamas and alpacas will be a common sight. A wild relative of the llama, the vicuña, is fairly common in the remoter areas of the Vilcanota. Also commonly seen are vizcachas, small rodents related to the chinchilla. Rarer animals include the Andean deer and fox, several species of wild cat and the puma. Amongst the birds we are likely to see are humming birds, torrent ducks, tinamou, vultures and of course the Andean condor. Unusual plants we may well see include species of wild lupins, cactuses and the beautiful queñoa tree with its papery red bark. This time of year is the dry season in the Peruvian Andes and there are long periods of stable weather with plenty of sunshine and only occasional afternoon showers. In the highest parts of the Cordillera Vilcanota there are sometimes high winds and light snow flurries. Although the sun can be strong and warm, temperatures at 4000m-5000m can be extremely cold, going down to -5ºC during the 12 hours of darkness each night, so bring a warm sleeping bag and a good book! For both the trek and climbing options customers should be experienced hillwalkers or trekkers but no climbing or mountaineering skills are needed. Previous experience of wilderness camping is very useful as these are very remote mountains. All customers on the trek should have a good level of fitness as we cross passes up to 5100m high and will walk for around 6 hours per day. For the climbing option some extra fitness and stamina is essential. Summit days will be only 6-8 hours long but will take the place of a rest day. If you have any doubts about the suitability of these expedition options for you then please give us a call. On this type of expedition there are a few hardships.. Cold nights, tired feet and some tinned and freeze-dried food are a few of the experiences which will just have to be enjoyed! All clients must be insured for medical costs and repatriation in an emergency. We recommend having insurance for baggage, personal liability and cancellation as well. If you would like advice on insurance please ask. Peru is one of the poorest countries in South America and it is a good idea to avoid tap water, unwashed fruit, ice, seafood and all food sold by street vendors. Vaccinations for tetanus, typhoid, polio and hepatitis are needed! Your doctor may also recommend rabies and diphtheria injections. Malaria and yellow fever precautions are not necessary as we won't be visiting mosquito risk areas. Peru (and particularly Cuzco) suffer from a bad reputation for theft. It is important to stay alert when in busy public areas and to guard your belongings carefully at all times. Muggings and other violent crime are rare. We will issue further advice to all clients before departure. Remoteness : You will be up to three days walk from professional medical help for periods of time. There is no chance of a helicopter rescue. Our treks and expeditions are designed to be small and flexible. The trek will be co-ordinated, organised and led by us, but as far as possible will adapt to the plans and aspirations of the members. We will consult and involve all members when planning the details of the expedition. Please note that the leaders decision is final where the safety of the group or any member is in jeopardy; for example where retreat or diversion is necessary due to illness or bad weather. This is one of our fully supported treks; you only ever have to carry a lightweight daysack (camera, water and lunch and spare clothing). On the Vilcanota trek we use donkeys or horses to carry all communal kit, food, cooking and camping equipment. This job is done by porters on the Inca trail. The minimum number of customers we need to run this trek is four. The maximum size of the trek will be six customers plus leader. We have no minimum requirement to run the climbing option. In some circumstances we may be able to run the trip with a local Peruvian leader if we have fewer than four customers.